Knowing where our food comes from is a huge issue; food safety and costs seem to figure more prominently in our lives all the time. Many people would like to grow their own vegetables but don’t know how to begin—digging, plowing, planting, weeding, and watering a large plot can be daunting. 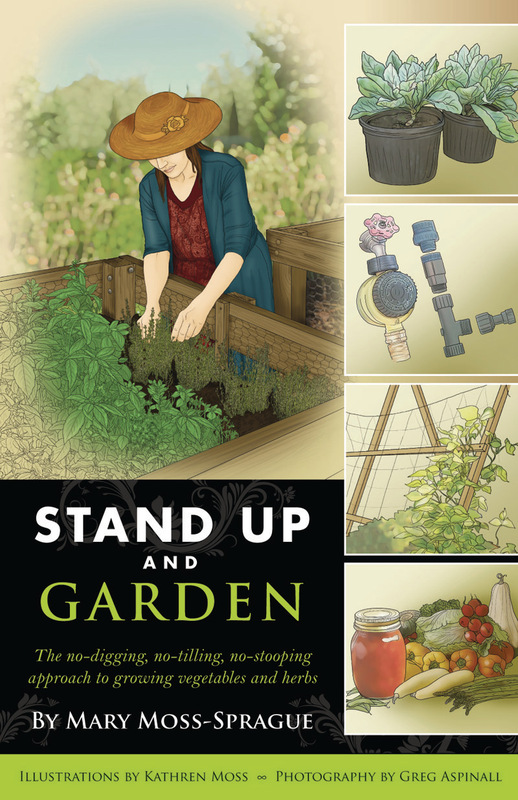 Stand Up and Garden shows how everyone can garden, including those with physical limitations like arthritis or location limitations like apartment-dwellers without backyards. Imagine harvesting radishes, carrots, and strawberries in the spring; herbs, tomatoes, and cucumbers all through the summer; beets, spinach, and even potatoes in autumn. By focusing on containers, trellises, and raised beds, Master Gardener Mary Moss-Sprague has improved upon traditional gardening by developing ways to grow plants that produce large amounts of food—enough for canning and other preservation—in small vertical spaces.New gardeners will find basic planting and growing information for a wide range of vegetables and herbs. Experienced growers will find economical, space- and energy-saving ideas. In addition to vertical gardening techniques, there are tips on overwintering plants and details on sustainable and eco-friendly gardening practices. Step-by-step illustrations and supply lists of inexpensive materials make projects like building a trellis or constructing a raised bed using straw bales accessible to everyone, regardless of ability or skill. There’s even a chapter on installing a micro-drip irrigation system—a very helpful innovation that eliminates the need for heavy hand-held watering devices.Use this great reference for inspiration and instruction on sustainable and economical gardening practices and techniques. Mary Moss-Sprague is a certified Master Gardener and Master Food Preserver and has written about gardening and beekeeping for numerous publications, including the Finger Lake Times, Ruralite, and BackHome magazines. She has worked with the Cornell Cooperative Extension Service of Wayne County (NY) to give public presentations and garden tours demonstrating her user-friendly vertical gardening techniques. Moss-Sprague’s own home garden was featured recently in the Great Gardens of Wayne County Tour.